Beverly Hills, Mich. (September 6, 2007) “America’s Survival Guide, How to Stop America’s Impending Suicide by Reclaiming Our First Principles and History” by Judge Michael Warren, is a “one stop, full-service” primer to raise the alarm about the impending suicide of America and to help stop it. The book will be published on Constitution Day – the anniversary of the signing of the Constitution (September 17, 2007) - by Mill City Press and cost $15.99. Warren is an Oakland County Circuit Court Judge and former member of the Michigan State Board of Education. In “America’s Survival Guide,” Warren describes how America is slowly committing suicide. He believes that contrary to popular wisdom, the most serious threat to America does not spring from overseas adversaries. The threat is from within. America’s history and First Principles have been cast aside and denigrated by the public, educators, mainstream media, legal profession, and politicians. According to Warren, this state of affairs imperils the country’s very survival; and these are self-inflicted wounds – the very definition of suicide. “America’s Survival Guide” is a “one stop, full-service” primer to raise the alarm about the impending suicide of America and to help stop it. Part I documents the challenge the country faces by surveying the overwhelming evidence of our ignorance and disdain of American history and First Principles. This crisis faces the K-12 system, higher education, the general public, media, and political class. Drawing heavily on the Founding Fathers, including Thomas Paine, John Adams, Thomas Jefferson, George Washington, James Madison, James Wilson, John Dickinson, and Alexander Hamilton, Part II clearly and concisely reviews America’s First Principles, and how the First Principles were the underlying cause of the American Revolution and became the foundation for the Federal Constitution. The work also reviews how those First Principles formed the basis of the struggle for racial and gender equality, and probes deeply into Abraham Lincoln,Elizabeth Cady Stanton, Susan B. Anthony, Martin Luther King, Jr. and others. Part III offers specific recommendations to combat the threat, including education, legal, media, holiday, nonprofit, and political reform. These innovative approaches include adopting an American Freedom Curriculum, reforming teacher preparation institutions, revising the bar exam, reorientating the media, and changing the political discourse. Each Part has its own independent value, and in some sense, stands completely alone. Together, they provide what Warren believes Americans need to stop drinking our collective hemlock. 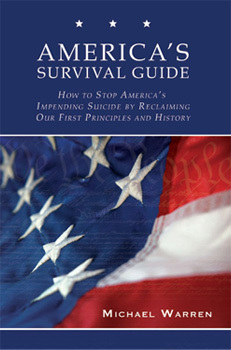 Commemorating Constitution Day, “America’s Survival Guide, How to Stop America’s Impending Suicide by Reclaiming Our First Principles and History” will be available to purchase beginning on September 17, 2007 through AmericasSurvivalGuide.com as well as Amazon.com and other retailers. For more information, go to AmericasSurvivalGuide.com.